HOK’s design team collaborated with Polsinelli, JE Dunn Construction and Plaza Vista developer VanTrust Real Estate to deliver an iconic building that celebrates a world-class law firm. The team’s challenge was to redesign a partially constructed mixed-use development on the Country Club Plaza for Polsinelli, the new anchor tenant. The building needed to support Polsinelli’s business needs and culture while creating a valuable asset for VanTrust Real Estate and a mixed-use amenity for the community. The design team’s plan maximizes reuse of the existing construction while creating a new building orientation. The outward-facing orientation acknowledges the prominence of this location and connects it to the Plaza. To reduce the building’s visual scale while accommodating Polsinelli’s program needs, the massing appears as separate precast and glass elements connected by a central glass link. By sliding the northern building wing to the east and the southern building wing to the west, the team designed an H-shaped footprint that provides outdoor spaces at entries while maximizing the number of offices along windows. The building’s vertical proportions and distinct precast texture pay homage to the adjacent Plaza architecture. A seven-story cantilevered stairwell that winds through the center of the building like a sculptural wood ribbon creates visual and physical connectivity. HOK’s space plan provides strategic adjacencies that optimize operational efficiencies and gives Polsinelli flexibility to reconfigure its space over its 20-year lease. Combined with ground-floor retail spaces and the adjacent Hotel Sorella, the addition of Polsinelli’s 450 employees has brought increased activity and vitality to the west side of the Country Club Plaza. Polsinelli office space: 225,000 sq. ft. / 20,900 sq. m.
Dave Harrison of VanTrust Real Estate shares the challenges and achievements that made Plaza Vista a 2014 EDC Cornerstone Award winner. 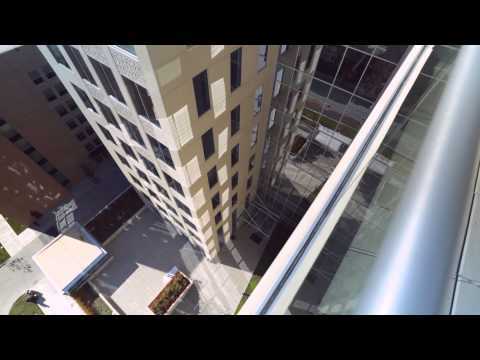 Watch a video celebrating the opening of Polsinelli’s new headquarters at Plaza Vista in Kansas City. The Kansas City Business Journal’s Capstone Awards recognized Plaza Vista, which houses Polsinelli’s new headquarters, in the “Mixed-Use” category for excellence in in real estate and development. The Urban Land Institute’s Kansas City chapter honored Plaza Vista, which houses law firm Polsinelli’s headquarters, with a Development of Distinction Award. See Polsinelli Headquarters on Google Street View.